Maybe......if your name is Sue of Oh2Sew..... *oops* Susan of CQ4Fun....talk about jumping the gun!!!! Sorry both Susans......I must need a good sleep! Congratulations Sue.....just pop me a quick email with your snail mail addy so I can get them to you pronto......can't wait to see what you make with them! what's that??? I can hear a collective *sigh*??? and stitch some pressies for your stash and be ready for all those upcoming birthdays! That is a gorgeous panel. A great win for Sue. Susan just loves this panel and will have great fun with it! Thank you so much. 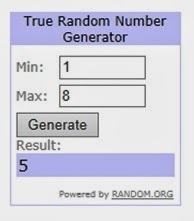 Strangely, I am number 5 for October, too, so Mr. Random better not pick it again! Congrats Sue. The panel has so many possibilities. Greetings from Spain! Congrats to Sue and Thanks for organizing this!